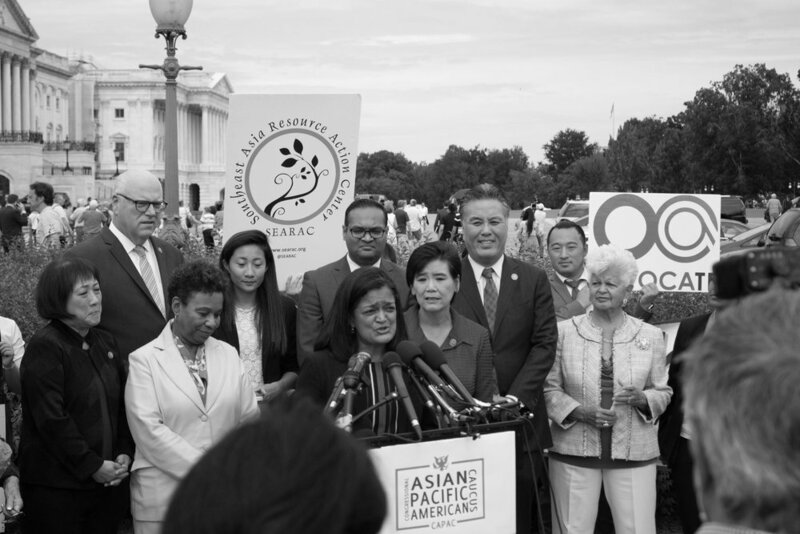 OCA – Asian Pacific American Advocates will continue to organize AAPI communities and coalitions to let Congress members know that family immigration should not be compromised for negotiation. We are disappointed that the DREAM Act was not attached to the Continued Resolution – a short term spending bill that will keep the government running for another month – passed by Congress. The new tentative deadline to vote on a long-term spending bill, and include the DREAM Act, is set for January 19, 2018. The National Korean American Service Education Consortium (NAKASEC), Southeast Asia Resource Action Center (SEARAC) and Asian Americans Advancing Justice - AAJC, are just few of our partners we have mobilized with in voicing the need to pass a clean DREAM Act. As allies, we have united on the steps of Capitol Hill in solidarity with the UndocuBlack Network and DREAMers in sharing stories of the negative impacts this bill will have on DACA recipients. Together, we have walked through the halls of the Cannon House Office Building, conducting advocacy meetings with staffers of Congress members to ask for their support, and to emphasize how important family immigration and sibling sponsorship is to AAPI communities. The work ahead in 2018 entails a lot of community outreach and asking Congress members to cosponsor the Reunification Families Act that will be reintroduced by Congresswoman Judy Chu's office. We encourage those who are directly affected by this to help us by sharing your stories so that we can represent the AAPI community as best as we can. In addition to our immigration advocacy efforts, OCA will be doing an analysis on the Promoting Real Opportunity, Success, and Prosperity through Education Reform Act (PROSPER Act), also known as the Higher Education Act. Currently, we know that this reauthorization does not have the best interests for AAPI students. We will continue to advocate for equitable education access and advise that you keep this bill on your radar. Like our Facebook page and keep checking our newsletters for more policy updates soon!